Chihuahua fully vaccinated microchipped wormed and flead. 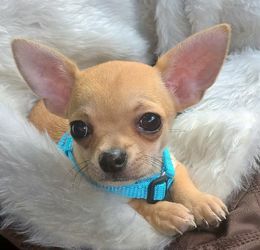 He will come with a Puppy pack including a bag of royal caning Chihuahua junior food puppy pads and a jumper and toys. Both parents are KC registered but the puppy won't be hence price. Romeo his dad is a Latvian import and has a fantastic pedigree including misty meadows.